Today’s warehouses are built with a state-of-the-art (SOTA) warehouse planning and design principles that allow for projected growth for up to five or more years. Layout designers create structures for warehousing facilities with room for growth even when the physical size of the warehouse property is limited. The focus on expansion is inevitable in most warehouse operations due to the expectation of business growth. Examples of today’s SOTA warehouse planning and designs are found in many locations where warehouses are part of huge, thriving complexes. In these locations, there is often large undeveloped acreage intended for future use of probable facility expansion. These may be built among other smaller sized warehouses for a variety of different business uses. In areas where older buildings have been remodeled or converted for warehouse use, these structures require specific layout design compatible with the existing building size and interior structure. Ideally, warehouse expansion in reconverted buildings is a priority. In newly built warehouse buildings, floor plans are designed prior to construction. However, even in new buildings, layout designs include warehouse expansion for floor plans. There is always a need to fit and retrofit storage with ready access for shipping and receiving goods and material handling equipment. The overall warehouse layout of a floor plan should be ergonomically efficient to allow facility managers to create fluid operations and safer working environments. For instance, the general layout of a warehouse may include storage areas, picker and packer areas, material handling lanes for forklifts and crating, packing and pallet areas, where applicable. The least complex layout design occurs in warehouses where only shipping and receiving is the major portion of daily operations. In this case, the design tends to be open and readily accessible to receive goods and move them freely to docking areas for shipping. Generally, these buildings require wide access lanes and rely on computerized equipment such as robotic forklifts to move goods through the daily process. If there is one thing warehouse facility managers find essential, it is potential for expansion. In an older warehouse building, this may mean redesigning areas of the floor plan that can easily be relocated on design drawings. The use of space for expansion purposes needn’t be a problem if proper warehouse planning layout, design and expansion strategies are discussed with expert, industry consultants from the onset. In addition to following basic design principles for new and existing warehouse buildings, a good design team coordinates floor layout with facility management’s potential expansion needs. In this way, warehouse business operations can adapt growth and expansion on an as needed basis. For many facility managers, the ever changing technologies that make daily operations safer and less labor intensive also have the ability to create the need for expansion. This usually occurs when warehouse management takes on new business with higher volume needs for storage of goods or shipping and receiving requirements. Floor space may then quickly disappear. The expert warehouse planning can quickly remedy this situation with the addition of mezzanines, material storage solutions and cantilevers. To the surprise of facility managers, formerly limited space suddenly appears available. Yet, saving and preserving floor space for future expansion isn’t the only service Culver Equipment, LLC offers. 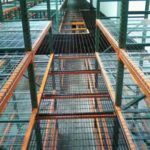 Other services include high end modular racking systems, fabricated racking for pallet storage, which frees up floor space and customized materials storage systems. In addition to mezzanine, cantilevers and catwalk systems, Culver Equipment provides industrial stairs, rolling warehouse ladders and modular office buildings that make all the difference to warehouse buildings with limited space. One of today’s industry leaders in warehouse consulting, equipment and layout design is Culver Equipment, LLC with 20 years of experience providing SOTA warehousing design and material handling systems. From layout design to installation, Culver Equipment, LLC has maintained focus on workplace safety for clients. As a licensed (ROC # 224390) warehouse services expert, Culver Equipment, LLC is a one stop resource for new and existing warehouse expansion projects. Great content. I would just like to add, that warehouse relocation or facility expansion can be a costly option. On the other hand, however, developing a floor plan within your existing footprint that maximizes every square inch of space can be a quick and easy solution that also dramatically reduces the time required between initial concept and final implementation. I agree that certain factors should be taken into consideration while planning for warehouse layout. Better layout of warehouse could increase the workflow of the warehouse and hence ensure better productivity. Introduction pallet racking system in the warehouse has dramatically increased the storage capability of the warehouse. However, without proper maintenance and management warehouse couldn’t work efficiently which has negative impact on the productivity of the warehouse. So, the condition of different components used in the pallet racking system needs to be inspected at a regular interval and if necessary should be replaced with suitable substitutes.